Instant pot pulao recipe (also spelled as pulav or pilaf) using mixed veggies and mild spices is so easy to make and its very delicious as well. 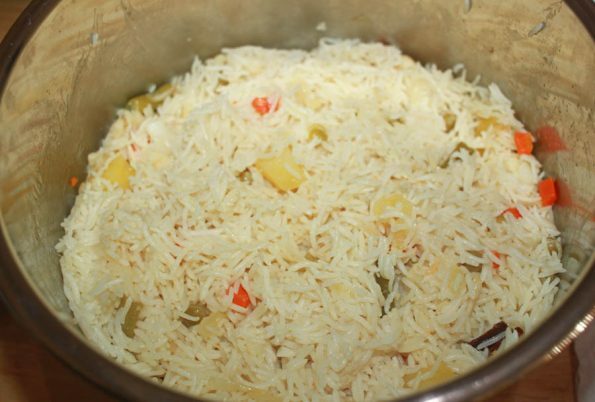 I have tried soaking the rice and also I have tried without soaking the rice, and found that there is no need to soak the rice in advance when you make the pulao in instant pot. In fact I found the texture of rice better when I didn’t soak the rice in water. So you can also try this recipe without soaking the rice in advance and see if you like it. The flavor and texture of the pulao will really depend on the kind of rice you use, as it has a lot to do with the texture of rice. The best rice to use for a pulao is white basmati rice I believe, but you can find different brands of rice within basmati itself. Try to choose a good quality long grain basmati rice to make the veg pulao for the best results. I used this long grain basmati rice to make this easy vegetable pulao. Also make sure to use fresh vegetables to be used in the pulao for the best flavor. Do not skip the whole spices for this instant pot pulao recipe, as we do not use any spice powders but only whole spices for the flavor. Instead of ghee, you may use butter as well, but using ghee will give you the best flavor for the pulao. You can use a variety of mixed veggies of your choice to make the veg pulao. However some veggies get cooked faster in the instant pot, so it may not be ideal to use such vegetables. Cauliflower, broccoli etc gets cooked really fast so if you are using them, you can stir fry or cook those in the beginning, transfer it to a separate bowl and add it to the cooked pulao at the end once the cooking is all done, otherwise they may get mushy in the instant pot. I have used a mix of carrots, beans, green peas, potatoes etc along with onions. If you are using dry green peas, you will have to soak the peas for about 6 to 7 hours in advance and you will need to use only about 1/4 cup of dry peas as they will increase in size as they soak up the water. You can also add more ingredients to the pulao like corn kernels (fresh or frozen), chopped nuts (cashews, pistachios, almonds etc which may also be lightly fried for better flavor) etc if you like. Indian veg pulao using white basmati rice and mixed vegetables can be easily prepared in the instant pot. 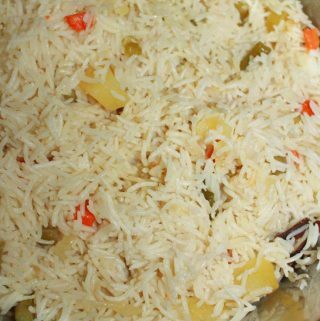 This is a one pot dish and it is easy to prepare, yummy and kid friendly rice recipe which can be served with raita, yogurt, pickles, curries etc as you like. Wash the rice very well in water for 2 to 3 times and keep aside. Chop the onion in thin long slices, keep this aside separate from the rice. Heat one tablespoon of ghee in the instant pot (by pressing the saute function and adjust to low), add the whole spices to fry. Lightly fry the spices for a few seconds. Add the chopped onions and enough salt, saute for about 7 to 8 minutes until the onions are lightly browned. Add the ginger garlic paste and saute for another 1 minute. Add the veggies, mix well and stir fry for about 2 to 3 minutes. Add the rice and one tablespoon of oil, mix everything well and stir fry the contents for another 1 minute. Add water and enough salt, mix everything well. Check the water to see if there's enough salt, as the water should be salty enough. Close the pot with the lid in sealing position, press the manual button and cook in high pressure for 6 minutes. The instant pot will take few minutes until the pressure is built and to start cooking, once the cooking is done it will beep, so you will have to wait until then. Once the cooking is done and the pot beeps, press the 'keep warm/cancel' button and wait for a natural pressure release of about 10 minutes. After an NPR (natural pressure release) of 10 minutes, carefully and slowly release the pressure manually by turning the lid to the venting position very slowly releasing the pressure gradually. Once the pressure is all released, open the lid and gently fluff the rice with a fork or gently mix using a good quality spatula. 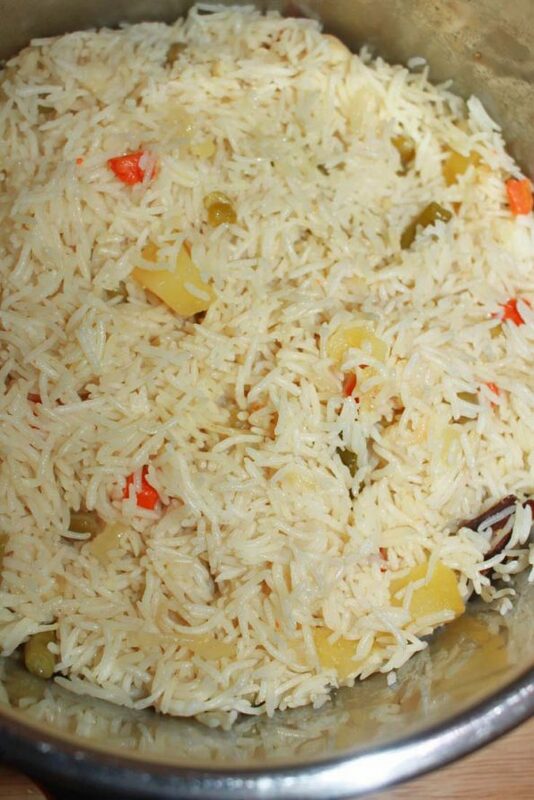 Serve the delicious and simple veg pulao rice with any curry, yogurt, pickles of your choice. You can choose your favorite veggies of your liking, though veggies like cauliflower and broccoli get cooked too fast in the instant pot and they may get mushy. So if you wish to add them, you can stir fry them first and then add to the pulao once its cooked. If using dried peas (you need only about half the amount), soak them in water for 6 to 7 hours prior to cooking. You can also add corn, chopped nuts, raisins etc to the pulao if you like. Hope you found this post on instant pot pulao recipe helpful in making easy and delicious veg pulao quickly and easily using instant pot.